ThingOne is starting to drop her final daytime nap. Some days she naps and some days she doesn't. On days she doesn't nap she tends to be overtired by bedtime, and the next day. This has led to some issues with behaviour. Not terrible in the scheme of things I suppose, but they're sometimes tricky to deal with. 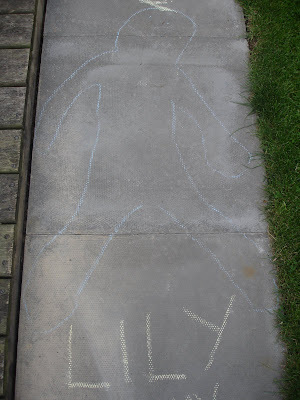 When I arrived home in the week to find several patterns on the patio like the one above, my initial fear was things had just got too far with Anne when a few toddlers visited and she'd been pushed over the edge. It turns out this wasn't a crime scene, but was ThingOne's latest obsession. Anne has been drawing around ThingOne with chalk so they can draw the features on (eyes, nose, mouth etc) as a crafternoon project, but ThingOne tends to like the drawing-around part and then gets bored, leading to a garden full of body outlines. This afternoon at the supermarket ThingOne was pushing things too far and refused to stay near me while I shopped. I try to do the disciplining when it's just me and ThingOne, as I hope it will make ThingOne better behaved in the week when Anne's dealing with two kids and it's harder to discipline. ThingOne's punishment for running away from me was that we didn't go to Sainsburys cafe after shopping (I had threatened this early on, and ThingOne didn't seem to belive me). This caused major upset and she pleaded with me to take her to the cafe, assuring me that she'd be a good girl now - she promised. I didn't give in and it was hard to do as I'd have had a much happier girl if I'd just taken her. My hope is now she'll know we will follow though on this threat and will behave better in the supermarket (and elsewhere). We're being a bit harsh on her I think, since she's not really being very naughty, just a bit over-excited and cheeky. This coupled with overtiredness can lead to some difficult situations so we're trying to clamp down.